Extraction of Reference Signal of Fundamental Based on Phase-control Switching Technology SHENG Xiaoyun;LI Xiaozun;LIU Jun;LI Hongmei;ZHANG Hengguo;Anhui Huadian Engineering Consulting & Design Co.
Research on Intelligent Monitoring of Transmission and Transformation Equipments for the Internet of Things XIE Guorong;ZHONG Zhi;Shanxi Local Power Co.
Development of Emergency Power Supply for Mixed Load LIU Hui;LI Duoshan;Hefei Lianxin Power Co. Comparative Analysis of Trigger Circuit of High Voltage Control Boards for Thyristor Valve LIU Qi;LIU Feichao;WANG Xiao;CUI Bin;Xi′an XD Power Systems Co. 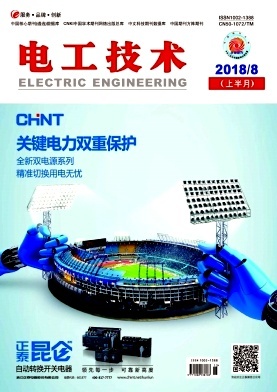 The Analysis of Lightning Electromagnetic Environment of Wind Turbine Tower Tube Based on Ansoft Maxwell WANG Yanjiao;ZHANG Jinsheng;WANG Ben;WANG Baogui;Southwest Jiaotong University;Training Center of State Grid Tianjin Electric Power Company;CSR Zhuzhou Institute Co. Constant Current Power Source Control of WPT System Based on Switching System HE Tianwei;Zunyi Aluminum Co.
Design of Grid Operation and Maintenance Training System Based on Virtual Reality Technology CHEN Wen;MAO Yafei;ZHU Yi;Hubei Huazhong Electric Power Science and Technology Development Co.
Study on Tension Calculation of Overhead Transmission Lines TAO Lei;ZHANG Nan;North China Power Engineering Co. Partial Discharge Detection Method and Device Design for Electrical Equipment LIU Tao;GUO Yaning;WU Pengchong;DENG Honghuai;Dinyoung Power Service Technologies Co. Discussion on Parameter Selection of Current Transformer SHAN Hui;CHEN Yongliang;XJ Group Co. Application of T-zone Protection in Coal-fired Power Plants WANG Hanrong;Energy China Yunnan Electric Power Design Institute Co. Discussion on Localization Relay Protection XU Hao;QI Chunping;DONG Changcheng;LU Fangzhou;NARI Technology Co.
Design and Application of Control System for Novel High Pressure Exhaust Valve of Steam Turbine LI Jian;Guangdong Yudean Jinghai Power Generation Co.
Design of the Secondary System Module for 35kV Vehicle-mounted Mobile Substation ZHOU Zhiyang;SHI Junwei;SONG Xiaosheng;XJ-Driescher Wegberg Electric Co. Analysis and Solution of Corrosion and Leakage of High Voltage Live Tank SF_6 Circuit Breaker JIA Shengnan;SHI Yanwen;Henan Pinggao Electric Co. Analysis and Research on the Closing Buffer Failure of a High-voltage Circuit Breaker WU Bin;AN Jing;PENG Chenguang;HUANG Fengpu;State Grid Zhejiang Electric Power Co. Treatment and Analysis on Rod Position Detector Fault of Rod Control and Position Indication System in a Nuclear Power Plant TAO Ning;TANG Xingdong;Hainan Nuclear Power Co. Analysis and Treatment of 25MW Generator Exit Switch Malfunction for Unknown Reasons WANG Shaopan;ZHU Lizhao;Shanxi Weihe Coal Chemical Group Co. Analysis and Treatment on Common Faults of Double Casing Turbulent Current Dense Phase Pneumatic Ash Conveying System with Positive Pressure ZHANG Xiaoying;Shanxi Zhangze Electric Power Co.
Abnormal Analysis of Potential Transformer Based on MATLAB HUANG Wen;LU Guoxiao;TANG Chenxu;HU Zhiwei;State Grid Deyang Electric Power Supply Company;Huaxin Conslting Co.
Research on Crimping Technology of UHV GIL Three-pillar Insulator LI Kai;MIAO Xiaojun;XU Zhongxun;SONG Jiguang;SI Xiaochuang;Pinggao Group Co. Cause Analysis and Countermeasures on Switch Tripping of Traction Substation Caused by Resonance Overvoltage of Heavy-haul Electrified Railway LI Xueshan;Daqin Railway Co.